Welcome to the website for Wrexham Symphony Orchestra, and thank you all for your support for our recent concert. It was lovely to see so many of you there for the first performance of our anniversary year. Thanks especially to maestro Leon Bosch and our soloist Rebecca Afonwy-Jones from Welsh National Opera. An exhilarating evening for all! Without pause the orchestra now starts on its next performance, the fiftieth anniversary gala concert. 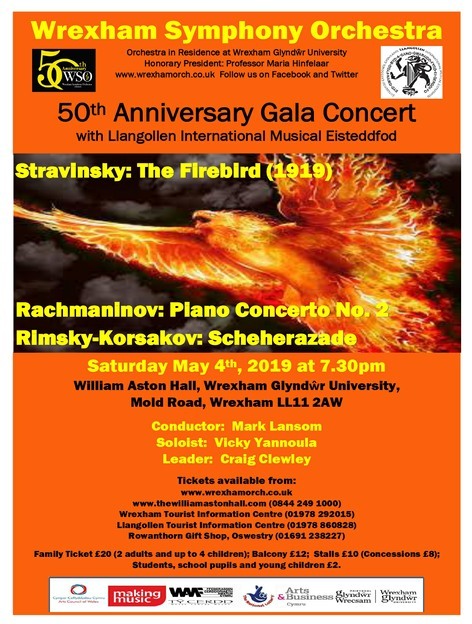 The orchestra’s own Mark Lansom conducts a programme which includes Stravinsky’s Firebird Suite and Rimsky Korsakov’s Scheherezade, with renowned international concert pianist Vicky Yannoula performing Rachmaninoff’s 2nd Piano Concerto. We look forward to seeing you there on May 4thh to join our birthday celebrations! This June sees a return for us to the British Ironwork Centre for our third Proms in the Park. Interest in the event is greater than ever before so please get your tickets well in advance. In July, as the world remembers man’s first walk on the moon in July 1969, we will enjoy a tour of Holst’s Planets, and welcome Sophie Rosa who will perform the Sibelius Violin Concerto. You can read more about future and past performances at our Concerts page. You can download the poster for the May concert here and also download the whole season leaflet here. Details of our Friends of WSO Membership scheme, which guarantees your tickets and offers a 25% reduction on standard prices can be obtained by sending an email to wrexhamso@gmail.com. Our scheme offers additional benefits. Full details can be found on the Friends page of this website. Looking ahead to 2020, we are now able to announce that on June 20 we are returning to the Bridgewater Hall, Manchester, to perform Mahler’s Eighth symphony. There are pictures of our previous concert day at the Bridgewater Hall here, when we played Mahler 2 in 2015. If you would like to donate towards the work the orchestra does or support it in any way please use the PayPal button below. A big thanks to those of you who have already done so. For Orchestra members, there’s a rehearsal schedule on the Members page. You can now download the new edition of our newsletter “Orchestrate” here. There is plenty of additional information about the Orchestra on our other web pages (see menu above) and on our Facebook group, Twitter feed - @wrexhamorch and Facebook page. If you want to contact the Orchestra, please do so through wrexhamso@gmail.com. Thanks for showing an interest in Wrexham Symphony Orchestra.